You can see the detail of Marr's map of housing conditions in Manchester and Salford in 1904 on this nice web interface. A scan of the map is georeferenced and overlaid onto contemporary base mapping. Produced by Alex Singleton and colleagues at UCL. 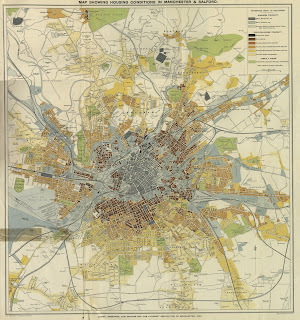 A lovely old thematic map of Manchester showing housing conditions in 1904. Taken from T.R. Marr, Housing Conditions in Manchester and Salford. Scanned by Alex Singleton and colleagues at UCL.